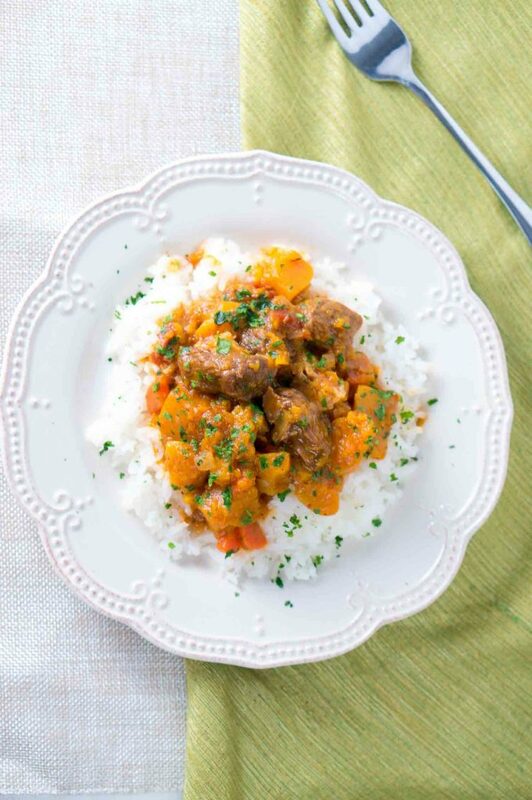 Beef and butternut squash stew is a quick and easy winter comfort food – perfect for all you butternut squash lovers out there. 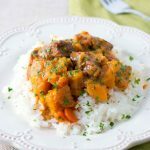 I used my Instant Pot to make this stew and it came out amazing – the beef was fork tender and the flavors were bold and delicious! I love to use my electric pressure cooker to make stews and soups. They require minimum preparation and cook very fast – in only 30 minutes I have a delicious and yummy stew waiting for me. If you are looking for quick and easy healthy family meals, you will love cooking with an [easyazon_link identifier=”B00FLYWNYQ” locale=”US” nw=”y” tag=”delimeethea05-20″ popups=”n”]Instant Pot[/easyazon_link]. It’s really a life saver. Especially with a baby and little time to cook. I am blessed to have my mother and grandmother with me to help me right now but it will be really handy when they leave and I have to go back to work after my maternity leave ends. Today, I am sharing with you not only a delicious and healthy winter meal that is quick and easy to prepare (I know busy moms will appreciate that) but also a great giveaway for Moms. As a new mom, I understand the daily challenges every mother faces with a newborn at home. It takes a lot of time, patience and effort to be a parent and take care of your baby. There is no “off” button. You can’t unplug and you really can’t escape. There are no sick days – you always have to be there for your children because they need you. There are no “real” vacation days – you are always taking care of your baby, running after your toddler or worrying about your teenager. I am sure if you are a mom or know a Mom, you probably understand just how hard of a job it is to be a mom. Frankly, no matter what I am doing, there isn’t a moment that goes by that I don’t think about my baby. Our parental instincts lead us to always put our children first, no matter what. And I agree, children need our care, love, and attention at all times. But I realize that we can be better moms when we also make time for ourselves in our busy daily schedules. I don’t know about you but my mom feet get tired and my mom shoulders get sore! I thought that this Mom Pampering giveaway will be perfect for you. It is valued at $335 and includes Julep cosmetics, GORUCK bag, dark chocolate and essential oils. See the details below the post and enter the giveaway. I hope one of my readers wins the package. Good luck! Add 1 Tbsp olive oil to the instant pot. Add onions, garlic, celery, carrots, tomato, and tomato paste to the pot. Season well with salt and freshly ground black pepper. Stir. Season beef stew with salt, black pepper and 4 Tbsp of arrowroot starch (or cornstarch). Add beef and butternut squash to the pot. Season butternut squash with salt and freshly ground black pepper. Season everything with sweet Hungarian paprika, thyme, rosemary and add 2 bay leaves. Stir everything. Pour wine and beef broth, and the remaining 2 Tbsp of the olive oil. Plug the instant pot. Close the lid, and turn the valve to sealing. Press Meat/Stew button and cook on Normal/High Pressure for 30 minutes. When it’s ready, press Keep Warm/Cancel button and turn the steam release to venting (aka quick release). Quick and easy winter comfort food cooked in the Instant Pot. Tender beef and delicious flavors! Add 1 Tbsp olive oil to the instant pot. Add onions, garlic, celery, carrots, tomato and tomato paste to the pot. Season well with salt and freshly ground black pepper. Stir. When it's ready, press Keep Warm/Cancel button and turn the steam release to venting (aka venting). I love that you put Marsala in this stew 🙂 And I totally hear you! I thought I would be a natural mother before my son came along– and then the reality sets in that it’s a constant job! You don’t even get to rest while you’re sleeping– you are on call 24 hours a day. There were times in the first 2 months I didn’t think I would survive the first year– but here we are, 16 months later, and it gets so much easier as time goes by. I can’t wait to see more photos Neli! This looks so great! 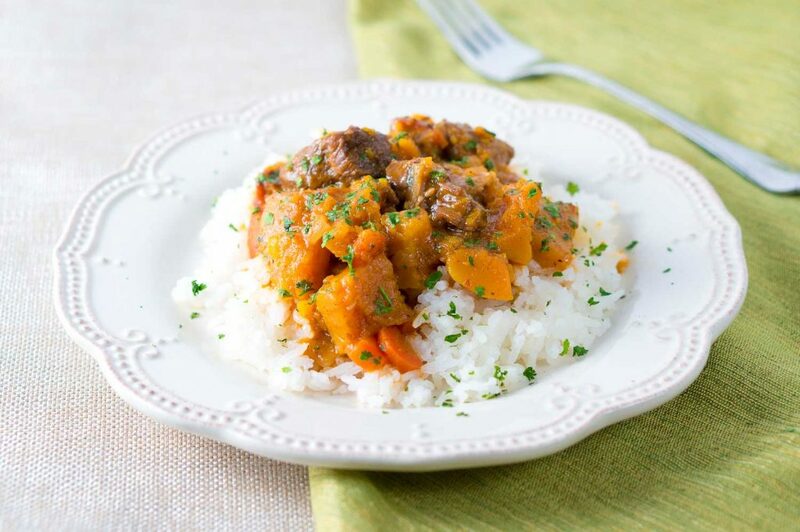 I love butternut squash and I like that it’s a twist on traditional beef stew! I don’t have an Instant Pot, but I’ve been more and more curious about them lately. After seeing this recipe I think I’ve made up my mind to get one! And enjoy that baby!!!! 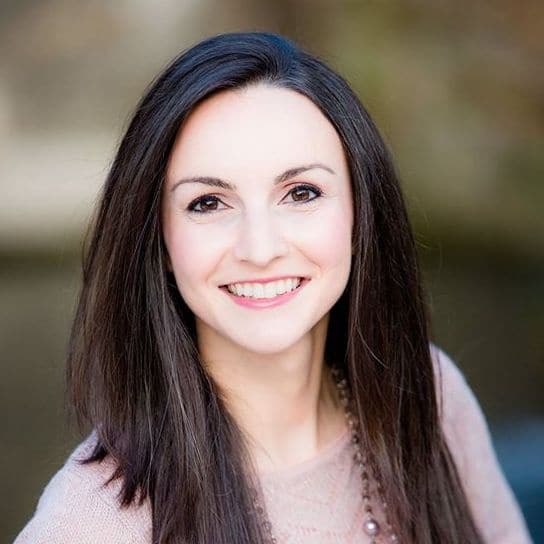 My baby is a junior in college…but it seems like yesterday I was where you are now! ? I have been hearing so many good things about Instant Pots! 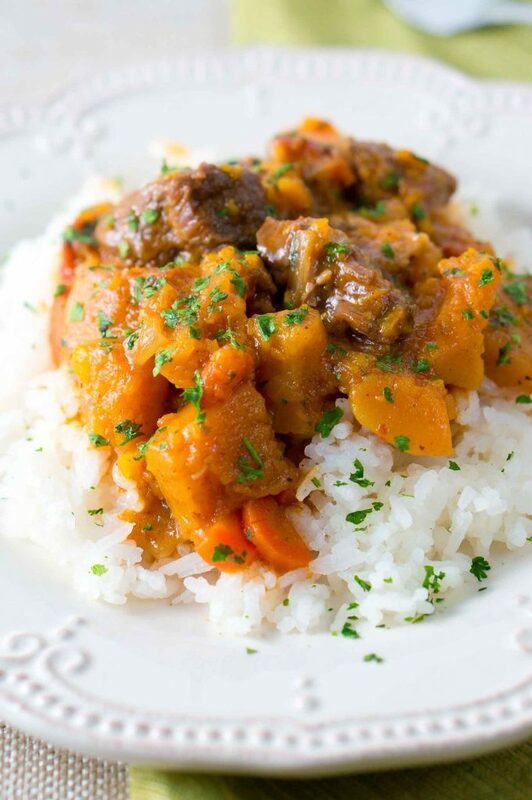 Your Beef and Butternut Stew looks delicious and so wholesome too. Love the vivid colours from the butternut squash and carrots. It looks really delicious. So easy and perfect for busy mums. I actually love meals I can just put in instant pot or oven, and go and do other things… like be with my kido, doing homework or cleaning … hahah well not much happy about that one but hey someone has to that too right 😉 Thanks for sharing the recipe! Happy Holidays Neli! I love beef stew and I love butternut squash. This recipe looks so good and sounds so tasty and EASY! Can’t wait to try it! Do you saute the onions, carrots, celery on the saute setting before you add the beef? How much is one serving, please? A cup? Half a cup? Thank you! One serving is 1 cup. Hi! I was surprised to read this recipe and it doesn’t require the beef to be seared before cooking. Have you found a difference in the tenderness of the meat if you just put all ingredients into the instant pot and cook vs searing the beef first and then cooking the veggies in the beef juices? I have made this twice now following the recipe to the letter and both times my pot will not build up pressure? Any ideas as to why? Hi Simon, have you had the same problem with other instant pot recipes? I am wondering if there is a problem with your IP. I don’t see why it wouldn’t build up pressure. All you have to do is, close the lid, turn the valve to sealing and press the program button (in this recipe is Meat/Stew). You said that you tried the recipe twice. How did you end up cooking the recipe eventually? I ended up taking half the mixture out and then it did eventually seal. It seems odd as I assume the recipe is for the insantpot? The mixture was well down from the max marks on the internal pot. With regards other recipes yes I have cooked other ones and have successfully sealed with them. I made this tonight and really enjoyed it. Aside from peeling the squash, it’s very quick and easy to make. I added a bit of cayenne pepper to give it little more kick. Great! So glad you liked it! 🙂 I am sure it was delicious with cayenne pepper, my husband loves to add some cayenne too. I would love to make this recipe, but can’t have wine or any sugar type item….suggestions? I would TRULY appreciate the help. Hmmmm ok thanks. I can’t gave sugar of any type or alcohol. I am making the recipe tonight and subbing with Apple cider vinegar…wish me luck 😁. Awesome! So glad you liked it!! It’s a true comfort food! There are such comforting flavours in this stew! I think beef and butternut squash go so well together. Once made, how do you think it would freeze? I know that it’s not recommended to freeze butternut squash, but since it will be broken down with the beef do you think it will hold up better? Hi Angelica! This is actually a great freezer friendly recipe. I make about 6 batches of this stew once a year and freeze them for busy days. It freezes very well, and after you thaw it and reheat it, you can’t tell it was a frozen meal – it tastes so good! I think you can cook it for 20 minutes instead if you are planning to freeze it and reheat it, so the butternut squash doesn’t lose its texture. OOO that sounds awesome! Will the meat still be cooked through after 20 minutes you think? I’m always afraid to do less time because then you have to wait for it to release and after that, you may find out the meat isn’t cooked all the way through and you have to then guess how much time to pressure cook again.